Through paint, paper, fibers, fabric, transfers and a "let's-try-this" approach to mixed media collage, I create the world as I see it - whimsical, colorful, fun and funny - offering the viewer playful but also profound insights into the essence of humanness and of Life itself. I am a storyteller. Whether the motifs are houses, trees, fish and moons or something more abstract, my work is always a narrative. Houses carry on conversations, learn to dance or how to become transparent. Trees dance, run or march to the beat of their own drum. Fish teem in cosmic seas, weaving tales from many moons ago. The story may not always be evident, even to myself, but it is inevitable. My intent always is to connect in whatever way is possible. My aspiration is to engage the viewer at one or more levels, be that physical, intellectual, emotional, visceral or even spiritual. My hope is to touch them in some way, to say: hey, look at this. This is me. This is you. My wish is that they see my work as a mirror, allowing the loving recognition of some aspect of ourselves with humor, warmth and compassion, that it will inspire them to reflect, to smile or perhaps even to laugh. For as Oscar Wilde reminds us: "Life is too important to be taken seriously." Jan McLean was born in California, grew up in the West, and lived for extended periods in Europe and Asia before settling in Connecticut. She currently lives and works in Shelton. Her work is represented at SoBoBo Art Gallery and Consortium at Walnut Beach in Milford, CT (www.soboboartgallery.blogspot.com). McLean comes to art from an eclectic background as a writer, linguist, anthropologist and poet. 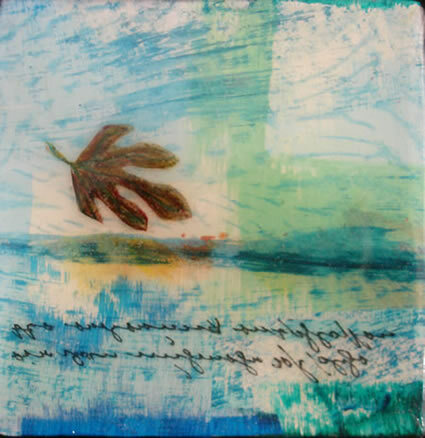 She has studied with mixed media collage artist Debi Pendell of North Adams, MA since 2002, and continues to refine and explore her art in workshops and retreats, and within the framework of an ongoing Independent Study series. She is an active and founding member of Syntax, a group of mixed media artists which exhibits regularly throughout Connecticut. 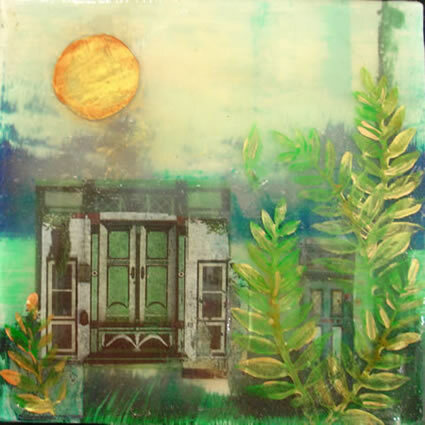 McLean has been engaged in an in-depth exploration of two aspects of her art: found object assemblage and acrylic faux encaustic. 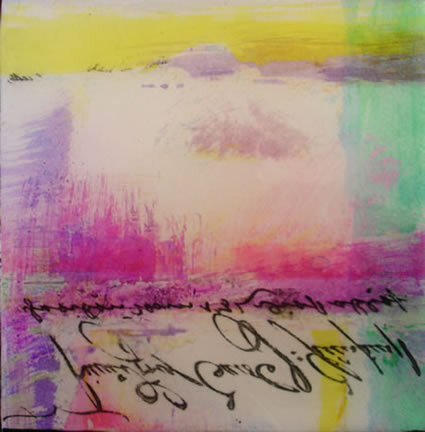 In the latter, repeated layers of acrylic gels and mediums are applied to create both actual physical depth while giving the illusion of depth and approximating the look of traditional encaustic. The process is one of both discovery and loss, both of which are reflected in her works. McLean currently teaches both these methods, as well as other mixed media techniques. McLean has exhibited in many galleries and juried shows throughout Connecticut, including: The Ellen Hyde Phillips Gallery, Fairfield Arts Council, Fairfield; John Slade Ely House, New Haven; Burt Chernow Gallery, Housatonic Museum of Art, Bridgeport; UConn Art Gallery, Stamford and UConn Art Gallery, Storrs; Hilles Gallery, Creative Arts Workshop, New Haven; Seton Art Gallery, University of New Haven, West Haven; Artspace Gallery, New Haven; River Street Gallery, Fair Haven; Kohn-Joseloff Gallery, Cheshire Academy, Cheshire; Bruce S. Kershner Gallery, Fairfield. Her works are in private collections throughout the United States, as well as in Europe and Asia. Jan McLean’s artwork can be viewed at SoBoBo Art Gallery in Milford, CT, on Facebook, by appointment at her home studio and online at the Syntax website www.syntaxartists.com.